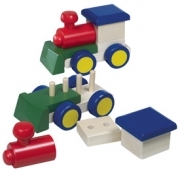 Stacking Train Truck Set Discounts Apply ! Take a boy's love of trucks and trains, add curiosity and the need to 'build' and you have the perfect toy! Set of your choice of two toys (train or truck). Hardwood constructed and hand-painted, these are two toys sure to bring oohs and awws and 'cools' to the little men in your life.